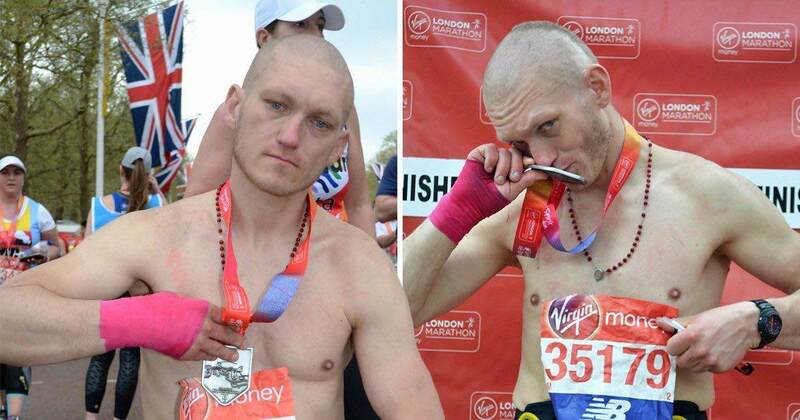 London Marathon Cheat Stanislaw Skupian Jailed For 16 Weeks. AN impostor who picked up a London marathon competitor’s lost race number and sprinted across the finishing line was jailed for 16 weeks yesterday. Homeless Stanislaw Skupian, 38, used legitimate runner Jake Halliday’s number after spotting it on the ground near the end of the race, Uxbridge magistrates court heard. Mr Halliday, who was running for charity Bloodwise, dropped his number after stopping to take off his T-shirt during the hottest marathon on record told him someone had been pictured celebrating with his finisher’s medal, the court heard. Jameela Jamroz, defending, said father-of-one Skupian harboured ambitions of running in the race and had started training for it. She said: “He wanted to be there, he was excited, he wanted to see the runners. He says by chance he saw a race identifier on the floor. In his excitement he picked it up thinking this was his opportunity to compete in the marathon. This was a dream come true for him. “At the time he hadn’t fully quite appreciated that he was doing anything wrong. Skupian, who used a Polish translator, had lived in the UK for about 11 years and suffered a neck injury in a car crash at the end of last year, forcing him to take sick leave from a catering trade job, Ms Jamroz said. Around the same time he separated from his wife and became homeless. He was arrested after police searched the multi-faith prayer room at Heathrow airport, which he viewed as a temporary home. On top of his jail sentence Skupian, who pleaded guilty last month to fraud by false representation and three unrelated counts of theft, was also banned from the airport for three years.